The rainy season has arrived! It seems that May has had more rains than usual. So far this month, we have received about 10 inches of rain. The pool has been over flowing! Most of the time, it starts to rain mid-afternoon and into the early evening, but other times it starts to rain later in the evening and well into the night. The past couple of days we have had clear skies and sun in the morning and then the clouds move in later in the day. The rains will accumulate slowly throughout the next few months. The heaviest of the rainy season in the Pacific Zone begins mid-September through October. It starts to clear in November. Mid-December is the start of the dry season/summer (high season). The dry season usually last through mid-April. Anyway, the rainy season has some good points. The first, it cools things off! It’s not nearly so hot here now. It’s a bit more humid, but at least it’s not HOT! Along with the better temperatures, the rainy season is great for the trees, plants and flowers. Everything is much greener and it will all grow much faster, too. 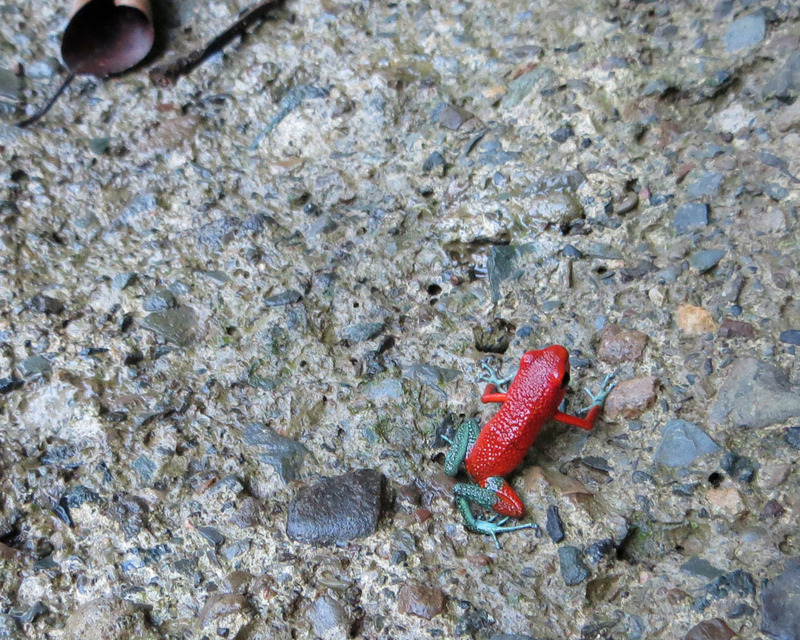 The rains also bring out the little, tiny poison-dart frogs. In a past post, I mentioned the Green and Black Poison-Dart Frog. 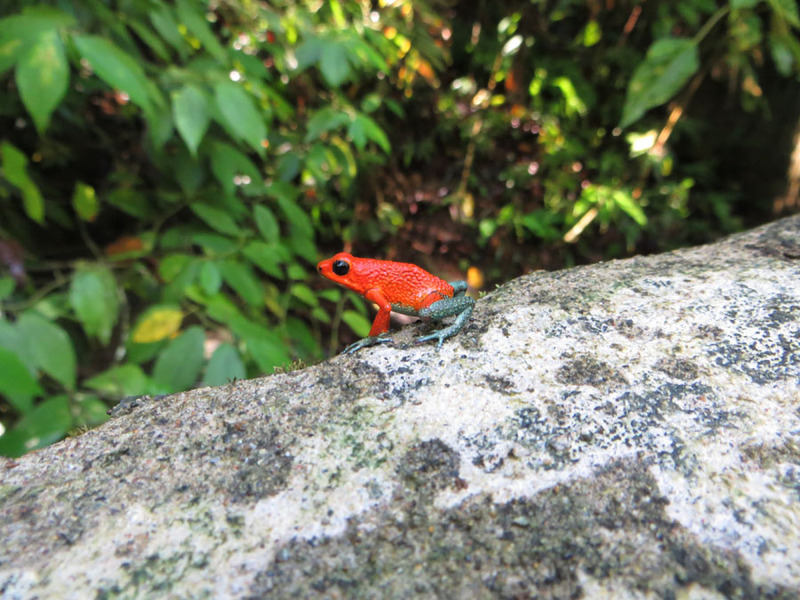 There is another poison-dart frog that is prevalent here and they are more visible during the rainy season. We have seen quite a few of them lately and they are soooo tiny and cute!!! These very tiny frogs are called granular poison-dart frogs (Dendrobates granuliferus). 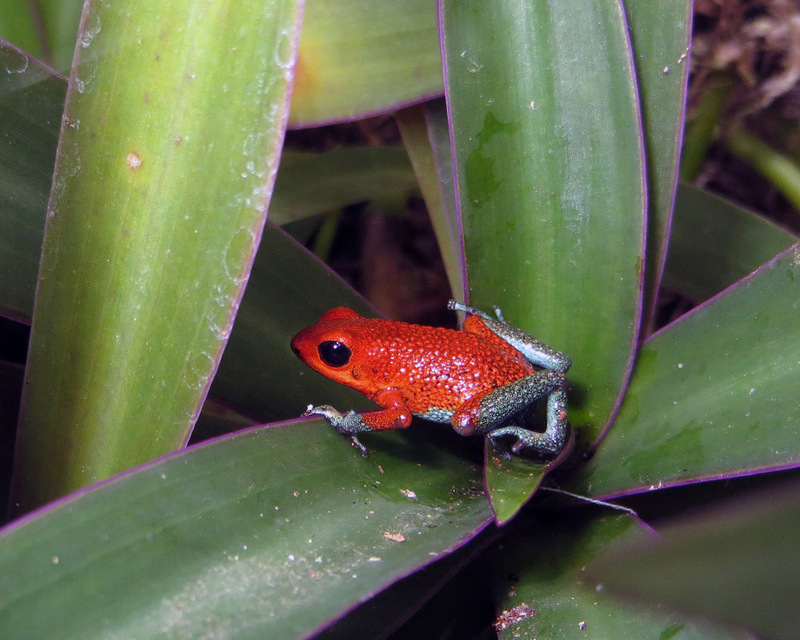 They reside on the Pacific side of Costa Rica and are not very common, but they are just as beautiful as the most famous frog of Cost Rica known as the Blue Jeans or Strawberry Poison-dart Frog (Dendrobates pumilio) of the Caribbean side of the country. This Pacific poison-dart frog lives in small creeks in the mountains and it’s especially visible and audible in the rainy season. The colors vary from emerald green to an orange or reddish on the body and bluish on the legs. The main difference between the Blue Jeans frog and the Pacific one is the granular skin. Both frogs are toxic, so it’s advisable not to touch them! Their skin has a substance that could be harmful if it’s accidentally licked or swallowed. These cute little frogs are so small…not even a 3/4 of an inch. They could easily fit on top of a quarter coin. It was difficult to capture them on the camera, but we gave it a try. 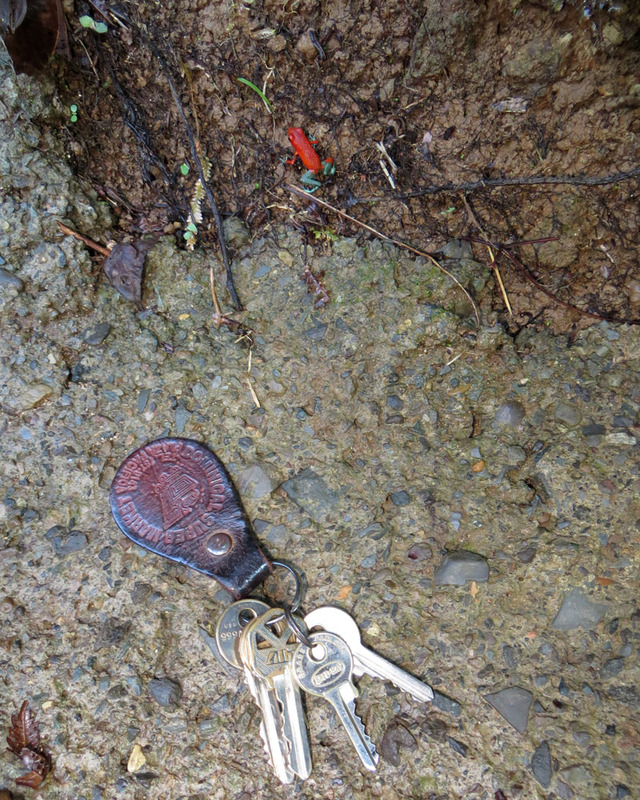 Here’s a photo with our house keys to give you an idea of their size. On another note, we are having some major Internet troubles. It’s a long story, which I will try to keep short. Our landlord has Internet over the 3G cellular network. When we arrived in January, it was unlimited high speed Internet. However, in April the company decided to change the program (without notifying customers), which is very common in Costa Rica. We found out when we were bumped down to a very slow speed much like the old dial up. It took a visit to the company to figure out what was happening. The “new” program is like this…at the first of the month, you receive high-speed Internet, but once you exceed 6 Gb of data download, you are downgraded to slow speed until the next first of the month. It doesn’t take much to get to 6 Gb’s! We have given up NetFlix and looking at our favorite T.V. shows via the Internet of which we only have two a week. Turns out that Face Time takes up quite a bit of data along with Skype. So we are doomed! So far this month we have already used up on 6 Gb’s and we still have two weeks until June 1. We are trying to find an alternative. Until then, Face Time and our Magic Jack phone may not work all that well. In addition, we will have to post lower grade photos that won’t take as long to upload. So sorry…but, what can I say…it’s not easy living here!!! C’mon amazing Eddie get a fix for this lol.